The citizens of nearly 70 American cities had the opportunity to see Elvis Presley on stage in both the 1950s and the 1970s. Half of them are in the South. One of the more unusual towns on the list is Albuquerque, New Mexico. It’s not that there’s anything unusual about Albuquerque. It’s just that in the ’50s Elvis rarely performed in the desert states of the Southwest. Putting aside Las Vegas, the showrooms of which Elvis would have played no matter where they were located, Elvis played only three Southwestern cities in both the ’50s and ’70s—Phoenix, Tucson, and Albuquerque. Elvis took his show to New Mexico’s largest city on April 12, 1956, and then again on April 19, 1972. Comparing those two appearances gives some insight into how Elvis and his fans changed during those 16 years. By the spring of 1956, Elvis Presley’s star was ascending rapidly. He had appeared seven times on nationally broadcast TV variety shows, most recently the Milton Berle show on April 3. 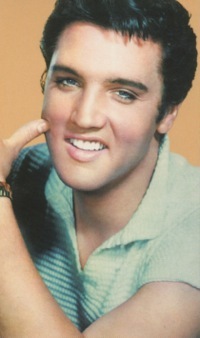 His first RCA single, “Heartbreak Hotel,” was storming up Billboard’s Top 100. He had just signed a long-term contract with Paramount pictures, and his personal appearances were drawing increasingly larger and wilder crowds. In early April, Elvis interrupted his brief tour of Texas to take his show into New Mexico for a day. Ads for Presley’s show began appearing in the Albuquerque Tribune and Journal on April 6. Elvis would headline two shows at the city’s Armory on Thursday the 12th. Among those also on the bill were “Grand Ole Opry” stars Faron Young and Wanda Jackson. Advance tickets were $1.50 for the main floor and $1.25 in the balcony. “Buy Now and Save a Quarter!” advised the ads in reference to the added cost of tickets at the door. According to the Tribune, Presley “attracted one of the largest crowds ever to attend a performance at the Armory.” Obviously, no one from the Tribune was part of that crowd, as the paper’s article the next day focused only on the aftermath of Elvis’s show. Fortunately, though, Lionel Crane, the Hollywood correspondent for the London Daily Mirror made the trip out to the dessert to see and report on Elvis for his readers across the pond. The next day Carla was all fired up about starting an “Elvis Presley Fan Club” in Albuquerque. She would be 29 years old before Elvis came back to her town. 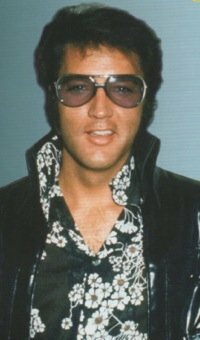 Much would happen in Elvis Presley’s life and career before he returned to Albuquerque. When he left the city in 1956, he had released just one single record and one LP for RCA. By the time he came back in 1972, he had 82 singles and 52 LPs in his catalog. He had no #1 records to his credit in April 1956. (“Heartbreak Hotel” didn’t reach #1 until May 5.) When he came back in 1972, he had topped the singles chart 14 times. Between his two Albuquerque appearances, Elvis made 31 Hollywood movies and starred in his first TV special. There had been many changes in his personal life as well. He was 21 when he first came to Albuquerque; he came back at age 37. He had served a hitch in the army, gotten married and become a father. It was a different Elvis and a different audience when he finally brought his show back to Albuquerque on April 19, 1972, exactly 16 years and one week after his first appearance there. Meanwhile, outside the coliseum hundreds of people gathered around the stage door, just liked Carla Singer and her friends had done 16 years before. They hoped for an autograph or maybe a kiss, but they would settle for just a glimpse of Elvis. But the hopes of everyone waiting outside for Elvis in Albuquerque that night would be dashed. "When Elvis left the city in 1956, he had released just one single record and one LP for RCA. By the time he came back in 1972, he had 82 singles and 52 LPs in his catalog."